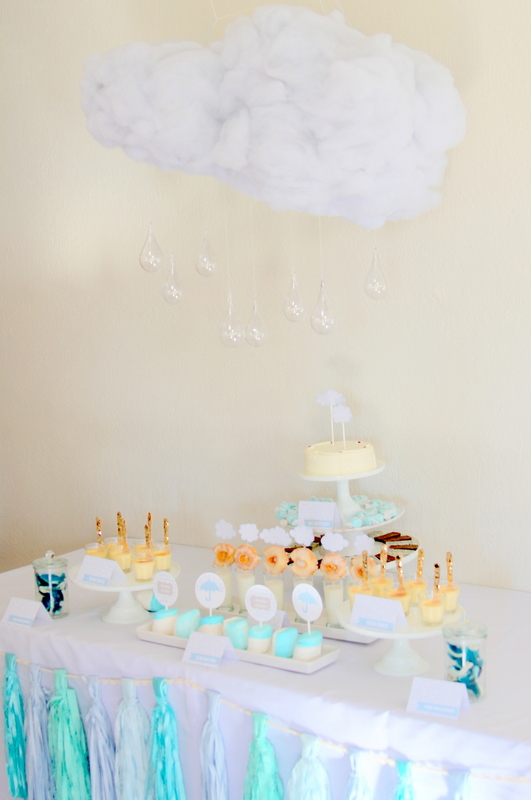 I can’t believe I haven’t shared this Cloud themed “Sprinkled with Love” baby shower with y’all yet! This ‘sprinkle’ was thrown in honor of one of my dearest friends in Denver (miss you Jenny! ), and was so much fun to put together. 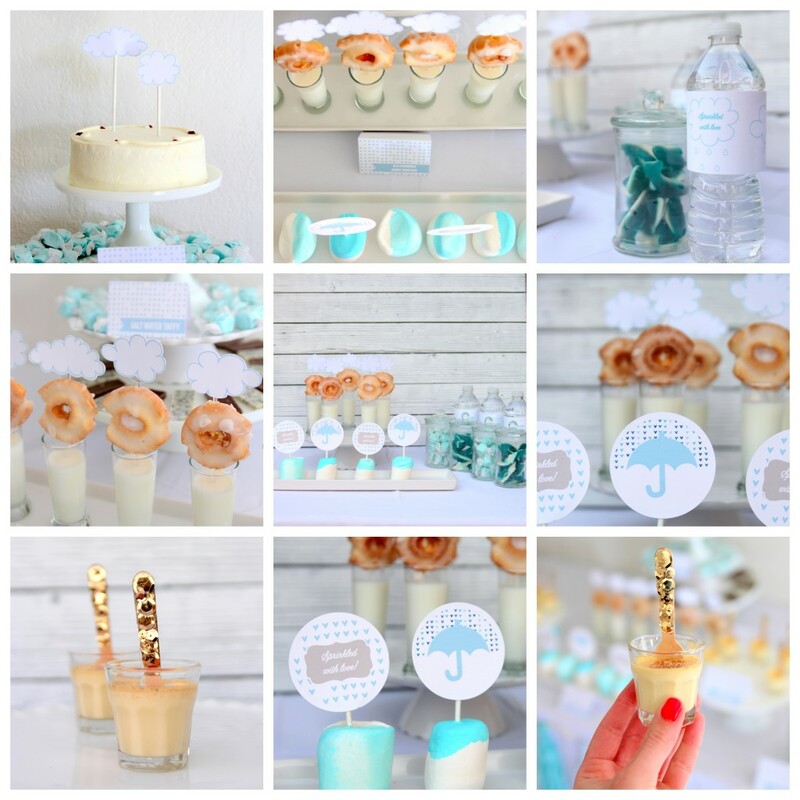 Since the shower was on a Sunday afternoon, we served treats and appetizers in all shades of white and cream and blue, accompanied by an ever-glorious Mimosa Bar. There were color blocked marshmallows, crème brulee shot glasses, milk shooters with old fashioned mini donuts, shark gummies (labeled ‘shark-nado raindrops’- I couldn’t pass up the opportunity to work in the greatest B Movie of all time), blue salt water taffy, and cookies and cream and chocolate squares. And, of course, an extra yummy cake from Whole Foods (they have a whole repertoire that I love and miss!). 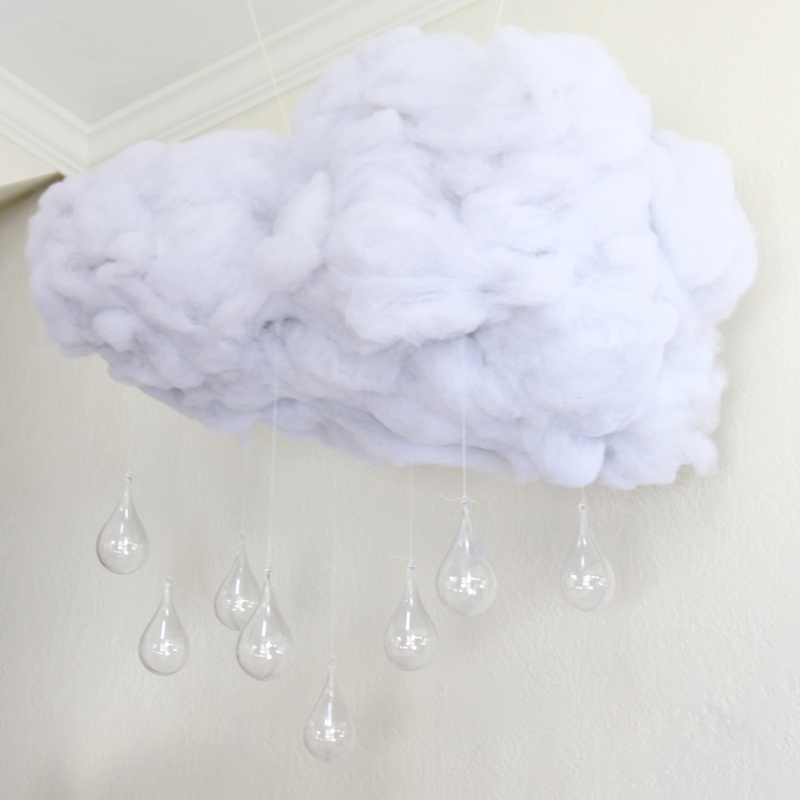 The giant fluffy cloud hanging above the treat table (made following this tutorial using balloons, paper mache, spray adhesive and batting) was the quite the star of the show. 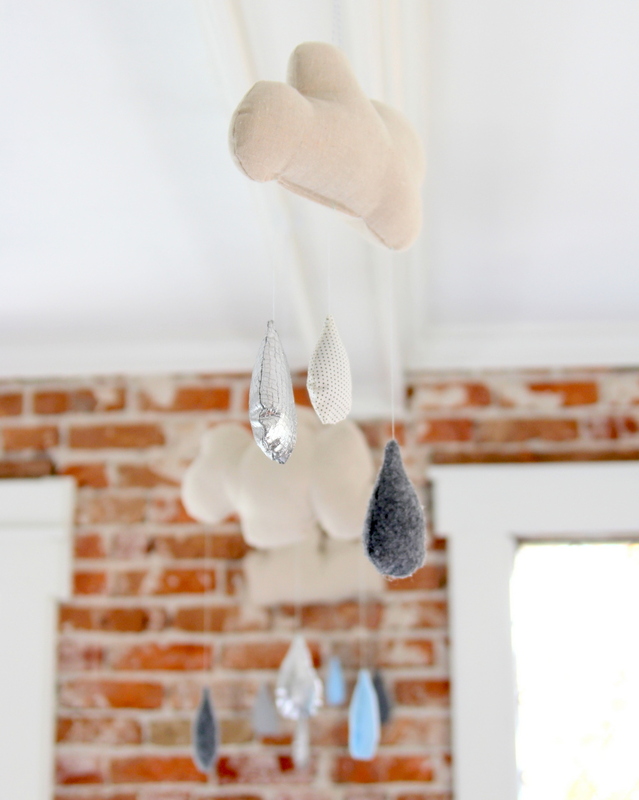 Little plastic raindrops were the perfect finishing touch (the cloud-and-raindrops became a mobile above the reading nook in the Smooches’ Denver bedroom– they were absolutely smitten and it was fun to put that labor of love to good use). 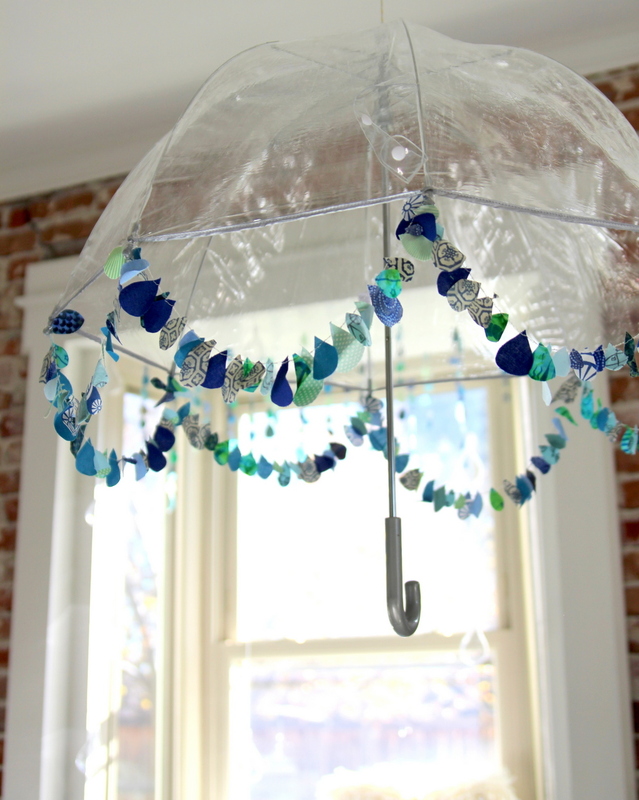 …and a clear umbrella with fabric raindrops! 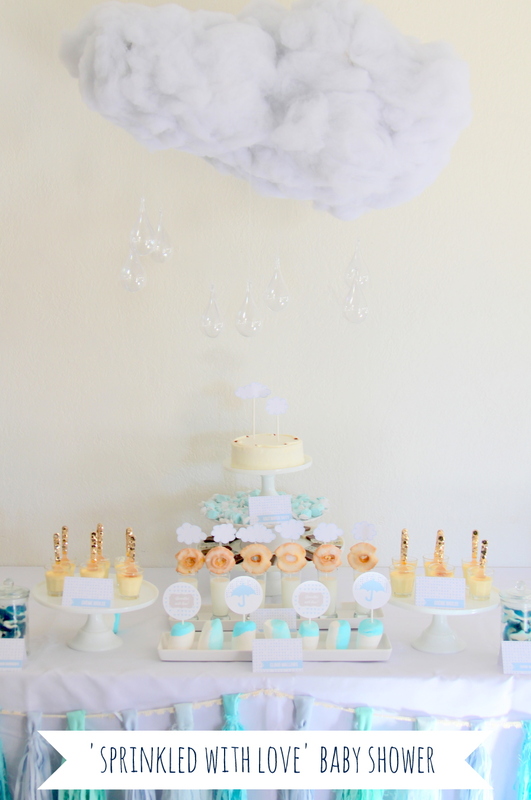 Of course, at a Sprinkled with Love shower, you can never have enough clouds, so there was cloud wrapping paper, there were cloud cake toppers, clouds and raindrops everywhere! I made homemade marshmallows (very cloudlike, no?) and tucked them in little parchment bags topped with “Thanks for *dropping * by bag topper labels. …and pampering goodies! Fun, right? In all, great party, fabulous friends, yummy food… is it weird to admit that after writing this I’m missing our Denver house something fierce (and also wanting to make creme brulee)? Wow! What a nice idea. 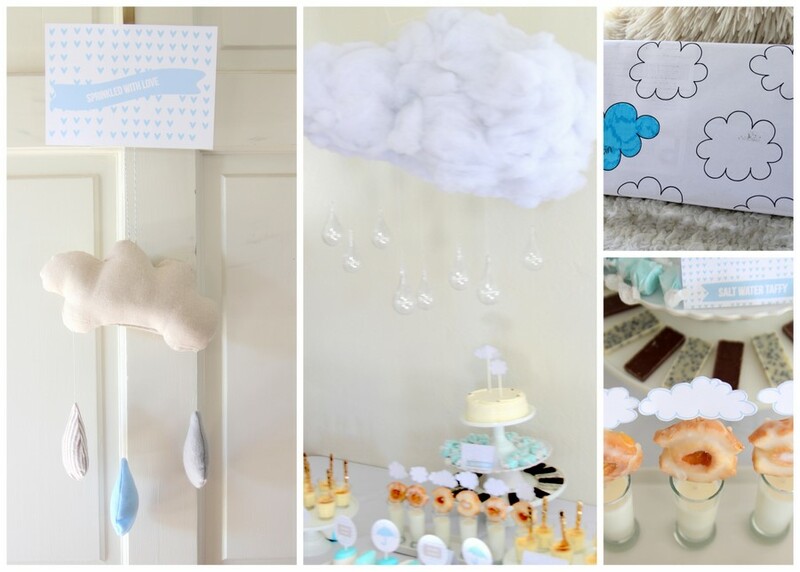 I never thought that a Cloud Baby Shower Theme will look so beautiful. I have regretted I decline the offer of my friend, but it was still the very awesome party/baby shower that I have. Well, this one really turned out great. Congrats for a job well done! Thanks Janet! And YES, loved the freezer meals (totally not my idea, but genius!). 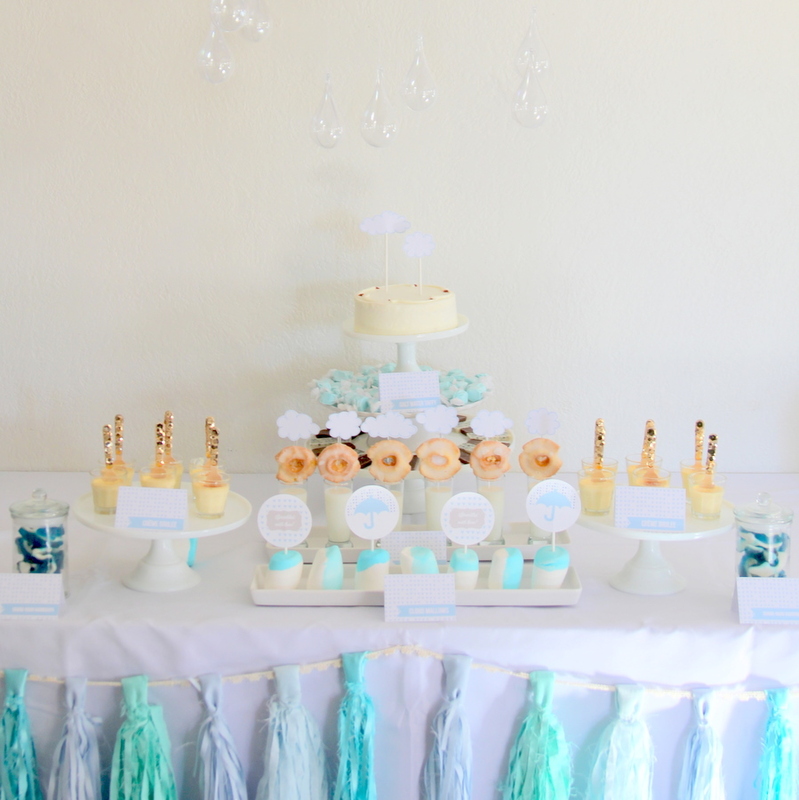 Wow, absolutely gorgeous baby shower! Everything looks amazing, especially the decorations, food and oh!! I love the freezer meals for gifts idea so much! I’m currently nearly 39 weeks pregnant with our third baby, and freezer meals would be my dream gift 🙂 Thanks for sharing! Linda, the freezer meals weren’t my idea, but they were SUCH a hit. 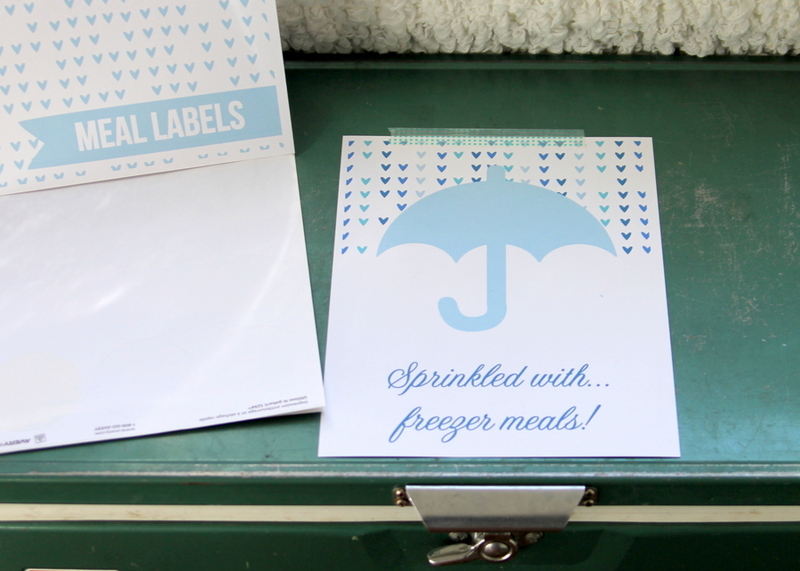 I am totally with you- I would’ve LOVED to receive freezer meals as a baby shower gift! Gosh this was such a good shower!!! Liz, it was SUCH a fun one!!! Miss you! Such a great shower idea! 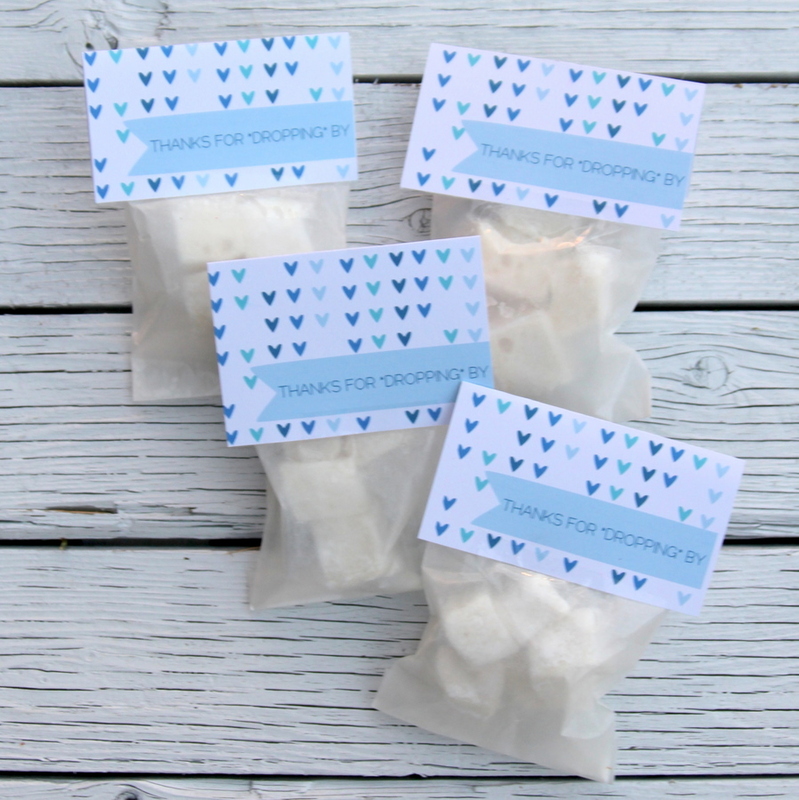 Would you consider putting the treat bag toppers in your Etsy shop? 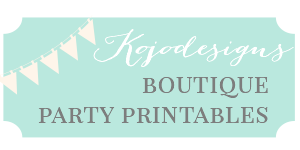 I would love to use them for a birthday party and/or Valentine’s Day! 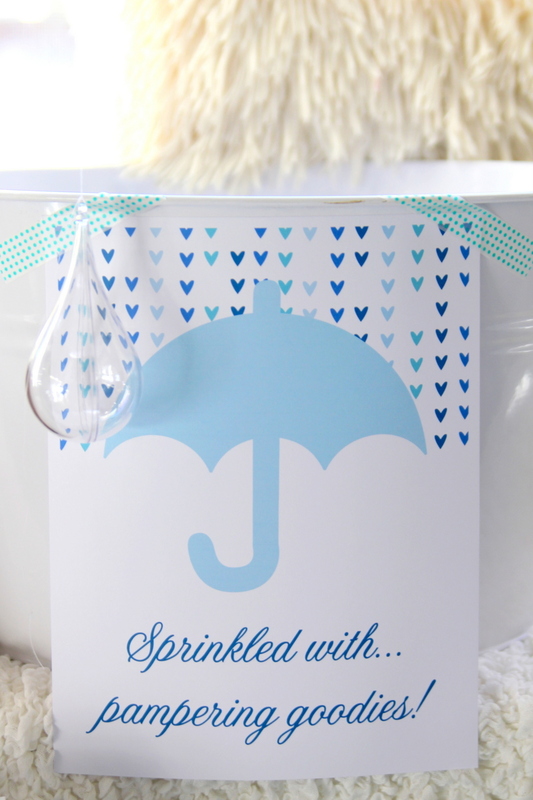 Cute shower! How did you fasten the umbrella to the ceiling like that? Thanks Nina! I used clear fishing line to hang the umbrella from the ceiling. 😉 Hope that helps!